I’ve heard many questions from customers trying to implement different SAML Identity Providers with SAP Analytics Cloud. First things first: what is SAML? SAP Analytics Cloud is the service provider. The browser will attempt to get access to the software and will be redirected to a third party Identity Provider that will be responsible to authenticate the user. The good news is that this is the native method used. When you get your tenant URL and login for the very first time to SAP Analytics Cloud, you are redirected to SAP Cloud Platform Identity Authentication service. This is the SAML Identity Provider used by default. How to configure your own SAML Identity Provider (IdP)? The product guide offers a section on the configuration: Enabling SAML Single Sign-On (SSO). As mentioned before, the product is already enabled for SAML SSO. This section should be named: Enabling your own SAML Identity Provider. I will only clarify some steps that I have been asked multiple times. This XML file with the certificate for your SAP Analytics Cloud tenant. It has to be imported to your SAML Identity Provider (IdP). 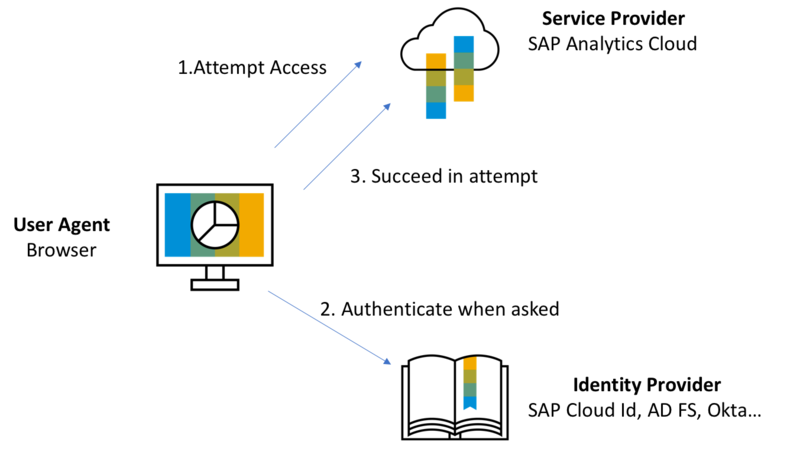 SAP Cloud Platform Identity Authentication. In product documentation, section Configure a Trusted Service Provider. The two main attributes you would like to use when mapping SAP Analytics Cloud users and your IdP users are: email or User ID. The User ID is always using uppercase in SAP Analytics Cloud and may be different from your Corporate Identity Provider. This is returned by the Identity Provider and returned back to the Service Provider (SAP Analytics Cloud). You won’t find it in any of the .xml files you used so far. If you want to see it, you need to use Web Development tools in Chrome. You can find complete details in this KBA 2487567. In my example, what is returned is the value JULIAN. As you may suspect, in this case, I need to select User ID in my attribute mapping in SAP Analytics Cloud. It should work as that is my User ID in SAP Analytics Cloud. It would have failed if the attribute returned was Julian. Please, verify the Login Credentials displayed in the step before. If you see USER, that is the Name ID attribute expected to be returned from your IdP. If your uppercase/lowercase don’t match completely, you can select email instead. You need to make sure that the Name ID attribute returned in the claim is also the email. Incognito: why? 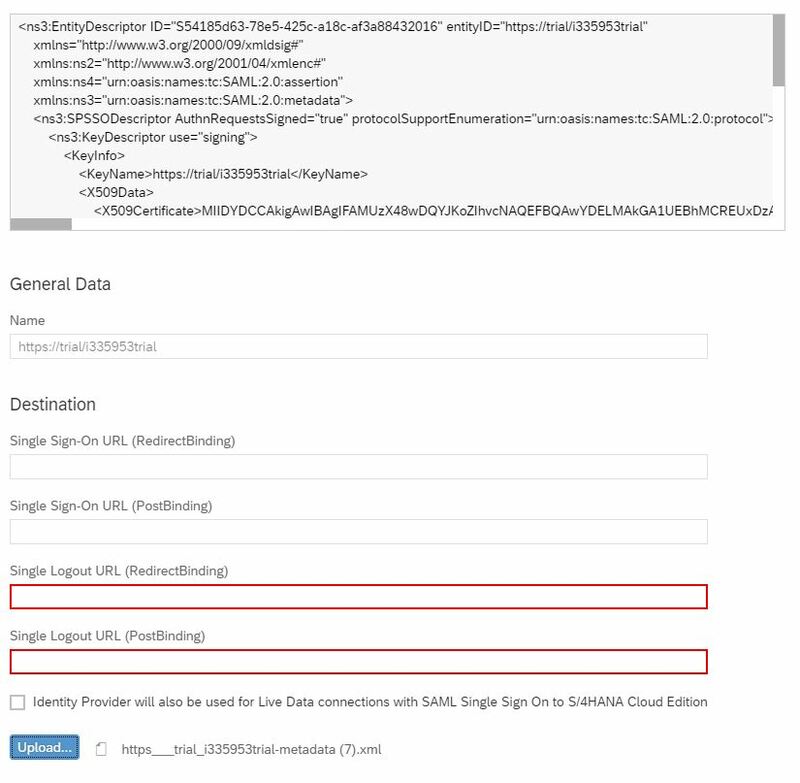 You are already connected to SAP Analytics Cloud with your user, you are connecting again using a different SAML IdP. Thanks for the article ! When I tried it, I used email in the Name ID attribute, but I always got ‘profile not configured for the system’ page after I log in through my custom idp. Could you shed some light on what might be the problem here? I presume that the email that is returned doesn’t match any of the existing accounts in SAP Analytics Cloud. Verify that the email returned exists (matching upper and lowercase) with one of the accounts in SAP Analytics Cloud. I checked the email address returned from my IdP, it matches with the current user’s email address. It seems that the “mapping to an existing user” step did not happen. If I hard code my IdP to have it return the user’s SCI profile ID (Pxxxx) as the NameID, then it works. Just to clarify, the email address is returned in the <NameID> tag of the assertion or as email address tag? In order to use email address as your credentials, it has to return in <NameID>. Thanks for your help Julian! I finally fount out that it is because my idp is returning the wrong Recipient in <SubjectConfirmation> . it works now ! I know it was a while ago, but can you remember how the IdP was set up incorrectly? We’re just going through setting up SSO for SAP Analytics Cloud against Microsoft Azure so trying to understand where the pitfalls may lie! thanks for the post. It workes fine for me. I have, however, one question. Can we configure more than one ID provider ? Or in different words: When the ID provider is not available, could we still log on with the original SAP analytics account ? At the moment we only have a single IdP for SAP Analytics Cloud. You can have your own SAP Cloud Identity that allows multiple Corporate Identity providers. I believe that the SLAs for this produc is similar to SAP Analytics Cloud. If the IdP is not available, we don’t have yet a fallback method to allow the admin to log in. I will try to document something around this topic. We’re just going through the process of configuring SSO from SAC to Microsoft Azure AD. I’m experienced doing SSO from Azure AD to various applications and understand SAML2 protocol etc. We’re concerned that, if we make a mistake in the configuration, then there is a chance we will effectively lock ourselves out of SAC – since we won’t be able to SSO back into SAC to switch the config back to using SCI instead of Azure AD. This occurs after I entered the verification URL. I checked SAML NameID which displays email also available in SAC. I haven’t seen this error before. Have you used the template that Azure AD provides for SAP Analytics Cloud (BusinessObjects Cloud) when creating this Service Provider? Having the same issue. Did you figure this out? Yes, I misconfigured it together with our Azure AD team. All necessary information is located in your metadata.xml file. Thanks for posting this blog, great stuff! 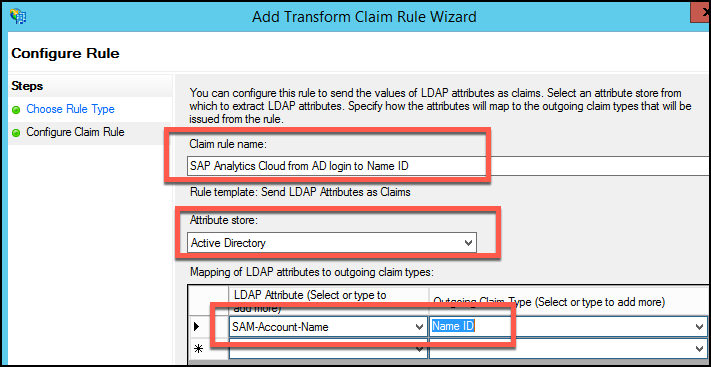 Is there a relation between the IdP in Analytics Cloud and the IdP setting in the underlying SAP Cloud Platform account? We have a particular case where we want to expose analytics to a C4C mashup without changing the IdP for the entire Analytics Cloud account. SAP Cloud Platform account and SAP Analytics Cloud use different SAP Cloud IdPs unfortunately. The same technology but different systems. You will need to have your own SAML IdP as you will require to import the SAC metadata file (as SAML service provider). You will require to have your own tenant of SAP Cloud Identity. If you have SAP NetWeaver Identity Management, you can follow the steps to configure C4C to use this SAML IdP. Thanks for this very instructive document. Does the user have to physical exist in C4A for SSO to work. I believe this to be true for C4C, is it the same for C4A? Yes, the user need to exist in SAC. This option will create the user in SAC on the fly. Another quick question, so is my understanding that if you use dynamic user creation, IPS wont be needed then if I am using ADFS? But if I am using IAS as the IDP, dynamic user creation does not work? I am not sure if I understood the question. What is IPS in this context? If you use SAP IAS as IdP, you can also check that box. As long as the user exists in this IdP, it will be created in SAC. IPS (Identity Provisioning Service) is used to create the user in the target system, and this case, SAC. So, I wouldn’t need the user to already exist in the SAC system, I could use either IAS or ADFS to get this user created on the fly in SAC via SSO? Hi Julian, very valuable information! What happens when I misconfigure SAML2 authentication or SAML2 authentication breaks due to e.g. expired certificates? How will I be able to login as an administrator to fix it? Service Provider renewal (SAP Analytics Cloud). You get warning and the certificate (metadata.xml) ahead of time so you can renew in your IdP. IdP expiration: bad news for now as you locked yourself out. The only workflow available now is to send us the new metadata.xml from your IdP via Incident with Product Support. We requested development to have another authentication method so customers can resolve this problem themselves but it’s still in evaluation. If the name ID or email case in Azure AD doesn’t match the case defined in Analytics cloud, how else can the user attribute be mapped? Have you come across any such scenario? In our case, user ids are defined as <FIRSTNAMEFIRSTLETTER><Lastname> and email is defined as <FIRSTNAMEFIRSTLETTER><Lastname>@<DOMAIN>.COM in Azure AD. However in Analytics cloud, username is all uppercase <FIRSTNAMEFIRSTLETTER><LASTNAME> while the email is all lower case <firstnamefirstletter><lastname>@<domain>.com. I am trying to come up with a way on how the user can be mapped between IDP & SAC. Any suggestions? You can always select Custom SAML User Mapping. There are three methods to map your users: USER ID, email and “SAML User Mapping”. That will open a new column in your Security > Users that will allow you to type whatever you want. You can type whatever you need to match the “Name ID” claim returned by Azure AD. Nice post and comments. I did the setup to use “Custom SAML User Mapping” and everything looked fine. But… when I tried to login through ADFS I got the error “Bad Request”. I verified in SAC that in the column “SAML USER MAPPING” also says “ext-fangio” for this user. Am I doing right? What could be the cause for the “Bad Request”? Have you tested with other users? Does trial account in SCP allows to use IdP for SAC? You seem to be trying to import HANA trial that is a Service Provider as SAML Identity Provider. You need the metadata of an Identity Provider: ADFS, Okta, SAP AIS, etc. We are trying to integrate CA SiteMinder as IDP and SAP Analytics as SP with SAML 2.0 protocol and getting issues while importing the metadata. It is not recognizing SSO & SLO Urls and there is no option even to add manually as well. Can you pls suggest if there is any additional setting needs to be done for SAML integration of CA SiteMinder with SAP Analytics. You should ask that question to your SAML IdP vendor. The metadata from your IdP must be incorrect. You can test it with a different SAML service provider to confirm that it’s incorrect. Good simple to follow doco here, but if you can influence the backlog for SAC – just wanted to raise a +1 (if you are keeping track) for a customer who really needs a case insensitive option going forward (or at least an SAC API to update the aliases) since both email and SAM Account Names are manually maintained and never consistently capitalised! FYI – I noted the SMP Note mentioning that this is being investigated as to whether it will be done. is there any chance to bypass SAML SSO on SAC once it has been configured? Like in netweaver giving a parameter in the url such as saml2=disable ? Any chance to do so?